When you're in a dilemma, between a rock and a hard place, between the devil and the deep blue sea, forced into a situation with only two ways out, both equally bad, you're between Scylla and Charybdis: between an enormous rock or the mythical sea monster who lives on it, Scylla, and the uncomfortably close-by mythic whirlpool and its second monster, both referred to as Charybdis, right where the tip of Italy's boot appears to kick the island of Sicily. We've considered Odysseus's story four times before, when we checked out the words Homeric, odyssey, nepenthean, and lotus-eater. Could you explain the meaning of each? These words come from Greek mythology, and they basically mean "two evils." Scylla and Charybdis are on opposite sides of a narrow strait of water. You're trying to sail through there. Scylla is a huge rock that you risk crashing into, and, Scylla is also a sea monster who lives on that rock and devours passers-by. 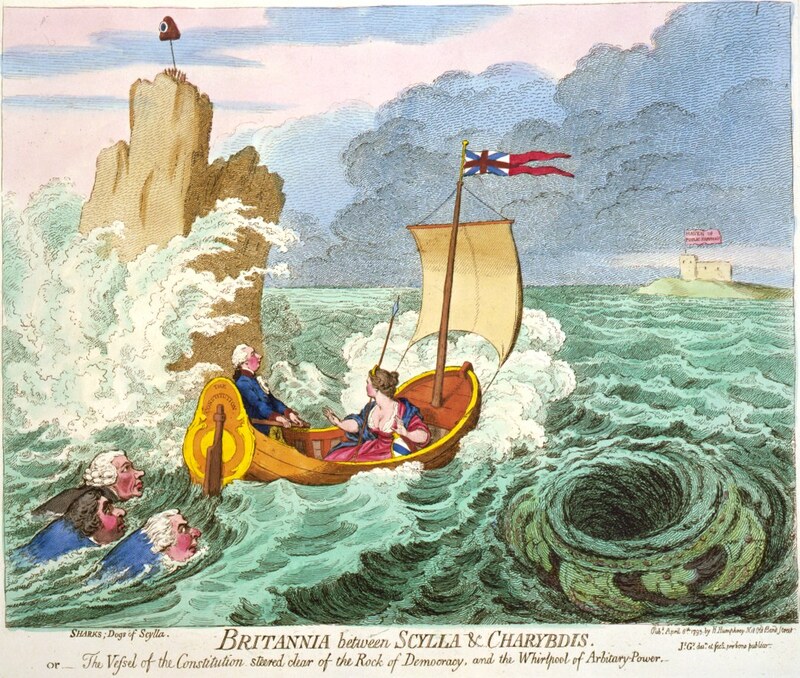 Charybdis is a whirlpool that's very close to Scylla, or a sea monster who lives there. So, to be between Scylla and Charybdis is to be caught between two bad or dangerous options, and often, it's specifically to be dealing with an opposite bad option because you were trying to avoid the first bad option, as if you're crashing into the rock--or getting eaten by a sea monster--because you were trying to avoid the whirlpool or the other sea monster. Because it's literary, and so very Greek, this phrase can sound snobby. So, be sure to use it when you're being formal or mock-formal. Talk about being between Scylla and Charybdis, being caught between Scylla and Charybdis, steering or navigating between Scylla and Charybdis, going from Scylla to Charybdis (or to Scylla from Charybdis), running against Scylla, being swallowed up by Charybdis, avoiding Scylla without being drawn into Charybdis, etc. You can get more specific with the word "of," as in "the Scylla and Charybdis of trying to please both of them." You can also specify what your Scylla and your Charybdis are. Here's Richard Brody for The New Yorker: "Movies about public figures...must confront the Scylla of impersonation and the Charybdis of unfaithfulness." I want to avoid both vagueness and over-sharing, my Scylla and Charybdis. In high school, as you write persuasive essays, your tone has to slide between the Scylla of blandness and the Charybdis of zealotry. Look away from the screen to explain the definition in your own words. You’ll know you understand what "Scylla and Charybdis" means when you can explain it without saying "a rock and a hard place" or "the frying pan and the fire." Fill in the blanks: "To (accomplish something, or avoid something bad) without (causing some other bad problem) is to steer between Scylla and Charybdis." Example: "To get your money's worth at the buffet without incurring a gnarly stomach ache is to steer between Scylla and Charybdis." From our previous issue: The word for this type of ache is a distorted pronunciation of the Late Latin word hemicrania, meaning "a pain on one side of the head." (You can see why it's related to words like "hemisphere" and "cranium.") What is it? Try this today: The word for this condition comes from a misreading of the Greek word for "point, edge, or peak," and is related to our word acme. What is it? B. SLAP ON THE WRIST. C. CHIP ON THE SHOULDER. 2. Having dodged the Charybdis of rejection--she said yes!--he suddenly felt _____ the Scylla of nervous anticipation.